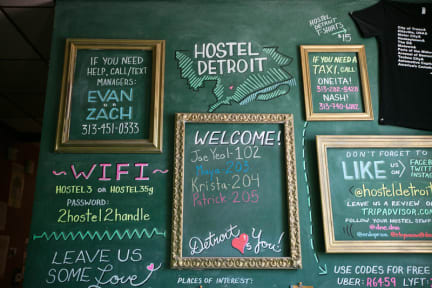 Hostel Detroit is awesome!! It's a great space in North Corktown with access to the city, great facilities and a great staff! No complaints, great atmosphere. It is written " You can't forget the Motor City " its has a certain magic that can only be described by it's secondary manifestations. Great place to stay if you're in Detroit. Clean, spacious, close to a lot of good stuff. Staff is friendly and knowledgable as well. Very friendly staff and guest. 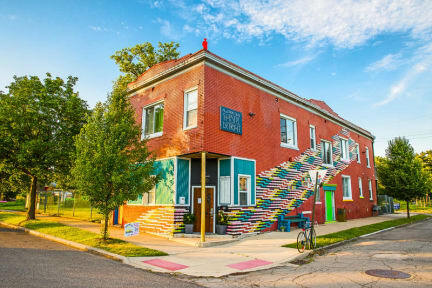 I stayed at Hostel Detroit with two female friends and we had a really enjoyable time. The building is artistically decorated on the outside and inside which gives a great overall vibe. The staff was helpful, friendly and knowledgeable and there were no security concerns during our stay. Great hostel! Clean, friendly, good location. Would definitely recommend! Awesome fun place, clean, cool people, walking distance to cool spots. Loved it! Great atmosphere, the staff was great and the place was really clean. I personally loved the suroundings of the hostel and would go back to it if I were to come back to Michigan. After coming from NY this place was where i needed to stay, Superb staff, excelent atsmosphere and the facilities made me felt like home. Would totally come back!